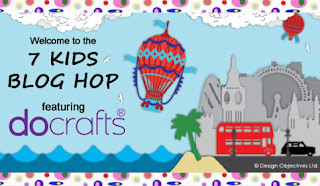 Now be sure to hop along and leave some blog love as you go because we will randomly choose one winner from one of our designers blogs to win a Awesome Do Crafts Prize! How Cool is that!! 8-) The hop will be open until Tuesday and the winner will be announced on Wednesday. Your next stop on the Hop is the Fabulously Talented Karen Gauthier! Ahhhh I really love these! 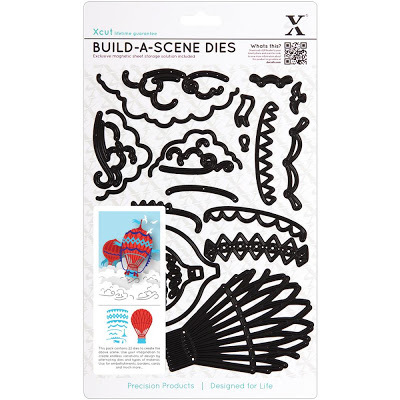 Great idea and fun to do...I need those dies now! Very pretty Shannon! What a fabulous card & the clay flower pot looks so real. Wowzers girl this is amazing!!! I love everything about it!!! And you were one of the two who didn't use Wellington the Bear, LOL! This is very much a WOW card!!!! Those flowers look like they're jumping off the page! SO PRETTY! The colors you used are so bright and cheerful. I think this card would bring a smile to anyone that received it. Great job. OH Shannon, these flowers are beautiful! Very pretty pot of posies! Love your idea of having a "go to" versatile card for all occasions! Shannon what a beautiful card...the flowers are gorgeous! I see it says "no comment" but i have a feeling that you've not been able to "approve" all of the wonderful comments that have been left yet! These are GORGEOUS flower pots!! I love every single detail you added to each card! WOWSAH!! OMG! Beautiful! This card brings a smile to my face! So lovely, well done! love this floral die, they are so versatile for creative crafty handmade embellishment! Beautiful! I love the flowers. Adorable cards! Love the dimension of the flowers.... great dies! I'll be checking them out! These are so pretty. Very different and someone will truly enjoy receiving them. 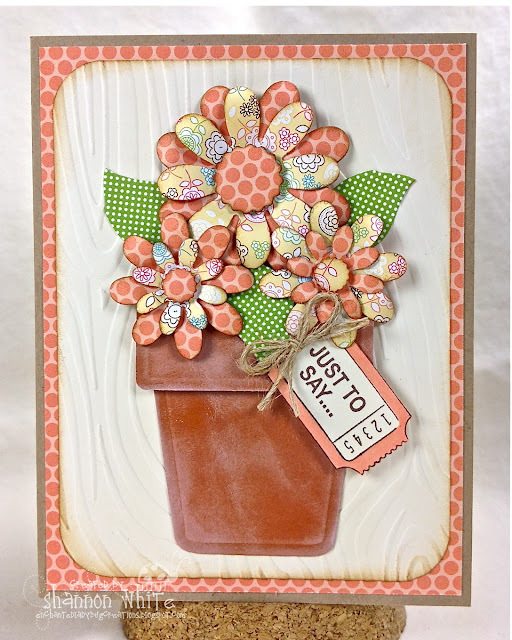 AWE your card is Awesome!love your use of the flower pot die on this. Wow Shannon... this is spectacular. Those colours grab you right off and pull you in. Gorgeous work. Such pretty cards!! Love the way you brought the pots to live! They look so real!! These are incredible, Shannon! Beautiful and creative. I just love your posies! Oh your card is just too darn cute! Lovely flower cards Shannon. Those posies are sooo pretty. I really like the earth tones and that pot! The ticket is just the perfect touch! OMGosh those flowers in the pots are just so FANTASTIC! LOVE how you can use them for so many occasions! How utterly sweet and adorable your cards are! 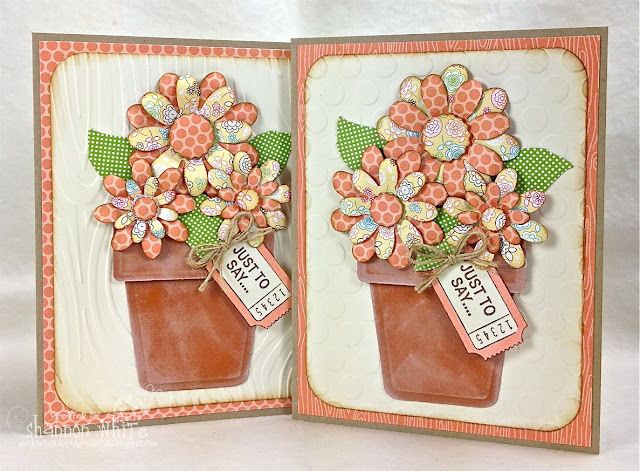 LOVE the flowers in the colors and papers you used. I have those flower pot dies and mean to use them this spring, but your flowers are way cuter than anything I have. I like how they aren't too ultra-dimensional to slip into an envelope. Awesome cards, Shannon! Oh my goodness. The dimension on these flowers is just beautiful!